Sciath na Scol Quiz Team bring home gold! On Tuesday December 11th, Cloghroe won the Sciath na Scol Sports Quiz for the second year in a row, with a magnificent score of 73 out of 80 points. Our second team also acquitted themselves very well. “There were between 80 and 90 primary school teams taking part so this was a great achievement” the principal Mrs. Dineen said. The trophies were presented by Dave Collins of Sciath na Scol. All children from Junior Infants to Sixth Class took part in a Skipathon as part of a whole school initiative to promote skipping. Mark from SKIPnROPE was an inspiration to us all! The Elf on the Shelf arrived in school frozen solid! He was actually in a block of ice. The North Pole must be really cold. He told the children that he would report back to Santa every day so the boys and girls were extra good in school. Many, many stars of the future were shining brightly during the month of December, as the boys and girls of Cloghroe NS performed their Christmas plays. Well done to all involved! 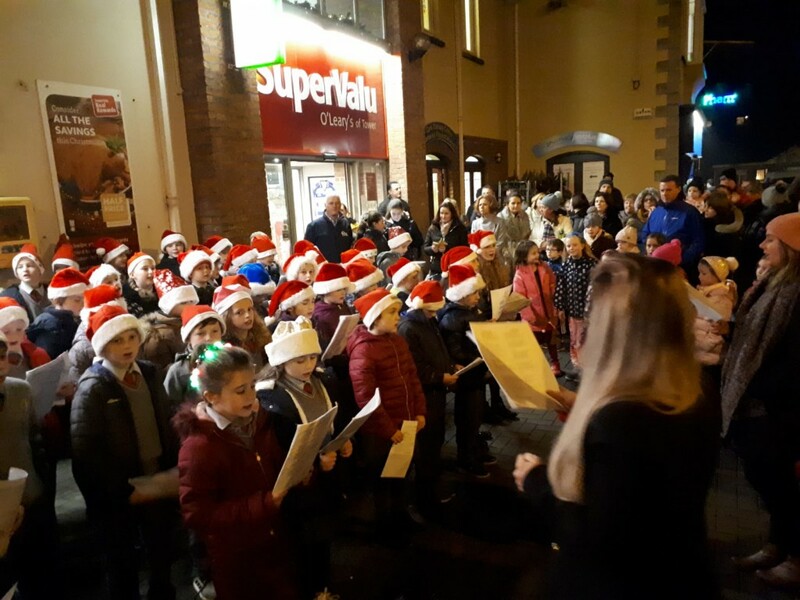 Children from Third Class took part in a carol service in aid of the Irish Cancer Society, while children from Sixth Class organised a bake sale in aid of Hope. The following morning, their teachers treated them to cookies and hot chocolate to say thanks for all their hard work. Children from the school have also been involved in many other fundraising initiatives in the lead up to Christmas. We would like to thank all who donated to Saint Vincent de Paul, the Simon Community, Penny Dinners, Swaziland Schools and Crumlin Children’s Hospital. Athbhliain faoi mhaise daoibh go léir! I nfants Christmas Morning Children from Junior and Senior Infants enjoyed a festive morning of art, storytelling and lots of fun. The infants were guided through the various Christmas areas by our wonderful Second Class children, who are truly a credit to our school. At the different stations, the infants decorated cookies, made reindeer food and Christmas decorations, coloured pictures and posted them to Santa, made playdough decorations and listened to Christmas stories. A great time was had by all!